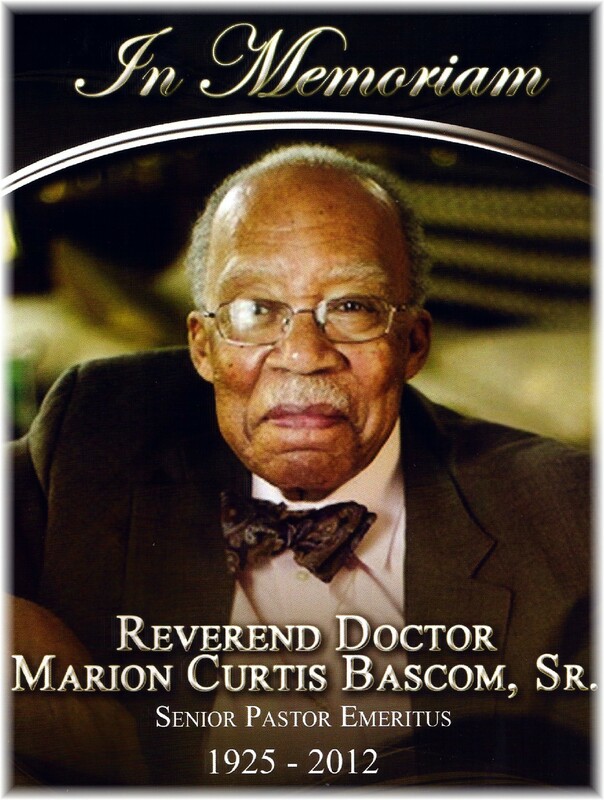 In Memoriam: Marion Curtis Bascom, Sr. If we have to die (and contrary to the belief of some, we all must) odds show that more people will do so in January than any other month of the year. While three of the most significant and life altering deaths of my existence thus far happened in January – two of them mere days apart in the same year –here lately the month of May has given January a run for its money. My dear friend and “Brother” Michael V. Dobson died in May 29, 2010. 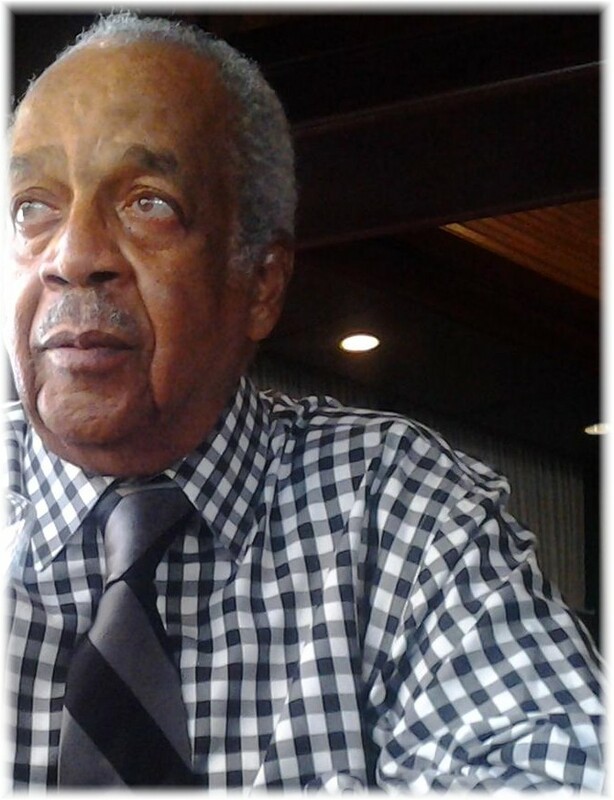 On May 9, 2012 another very close friend, campaign manager and “Brother”, Terry W. Taylor died and days later, on May 17, 2012 the Reverend Doctor (“Uncle”) Marion Curtis Bascom, Sr. made the transition and joined with six fellow Goon Squad members who crossed over years before. 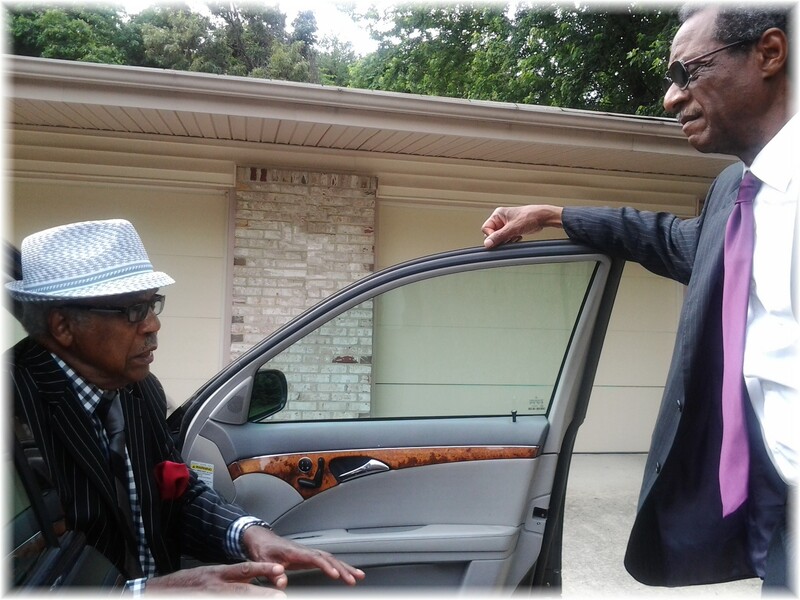 After Uncle Marion’s Memorial service Saturday, May 26, 2012, I had the honor, pleasure and self-appointed duty to chauffer around two of the four remaining Goon Squad members, O. Patrick “Pat” Scott and the ever dapper Dr. “Uncle” Homer E. Favor. Lalit “Lal” Gadhia had to get back home for another engagement. Rev. (“Uncle”) Vernon Dobson had already endured a draining week of emotional extremes. The high was a celebration of his life in the ministry and the low was the overpowering fact that Uncle Marion – who certainly would have been physically present for that celebration – had left this earth just three days prior. Understandably overwhelmed, Uncle Vernon was not in attendance. After spending a considerable amount of time that morning wrestling with a bowtie dawned for the first time in my effort to pay respect to Uncle Marion’s signature style, Pat and I rode together to the church. When it was over I had hoped to connect with at least some of the others. Uncle Homer did not disappoint. “Pooh, you goin’ to the cemetery”, asked Uncle Homer. “Not unless you wanted to” I replied in a tone reassuring him I was at his disposal. “Hell no! I saw the funeral director looking at me sideways …”, he bends and leans to demonstrate, “… sizing me up! I told him, ‘Man, stand up and look me in my eye! I’m ain’t plannin’ on goin’ anywhere any time soon”, he jokes playfully. With that the three of us left the Douglas Memorial Community Church where Uncle Marion had pastored from 1949-1995 and headed downtown to break bread at McCormick & Schmick’s, one of Uncle Homer’s favorite restaurants. The stories and political, socio-economic discussion began almost as soon as I shifted our “chariot” into drive. It seemed as though every block we traveled held memories of both joy and pain. We talked and laughed through our late lunch and then on to Uncle Homer’s home. The conversation never stopped. Funerals and Memorial Services are bittersweet occasions but, for me, Uncle Marion’s service was much more sweet than bitter. I saw many old friends, heard and retold stories that will never lose their splendor and most importantly remembered the life of one of God’s servants so well lived. Some asked if I were going to write something solely about Uncle Marion as a supplement to The Goons (Take: 1) piece I authored about a year ago. While I knew Uncle Marion’s life was colorful, robust and clearly worthy of its own literary treatment I had yet to process Terry’s death and what his loss meant for my life. So once again, a member of the Goon Squad comes to our rescue. I am publishing Uncle Homer’s unedited words about his dear friend and brother, Marion Curtis Bascom, Sr.
Members of Marion’s family asked me to pen a few lines about him that might capture the essence of his being from the view point of one of his many close friends. Reflecting upon the matter proved to be challenging, if not daunting. How can the highlights of one so accomplished be treated adequately in just a few words? I was reminded of my feelings when queried about him by Tosha, our physical therapist. Among the many superlatives that I used in describing him to her, irascible provided the three of us considerable amusement. I arrived in Baltimore in 1956 to begin a long career in teaching and administration at Morgan State College. The Reverend Gus Roman, Pastor of the First Baptist Church on the east side, took me to meet Marion, whom he held in highest regards. I found him to be imbued with concern about the abject denial of his people, at the time. For instance, there was not a single person of color serving in any capacity above the most menial category in department stores, supermarkets, banks, print/broad-cast media, or any major sphere of economic activity. In fact, there was only one black in the City Council and only a single one in the legislature. Persons of color were not accorded gainful employment in either municipal or state governing bodies. Those with the Federal government were relegated to positions below Grade 5. My colleagues at the Johns Hopkins, University of Maryland and the other exclusively white institutions were welcomed to break bread with me and my faculty at Morgan State. The reverse situation was a no-no. Suffice it to say, this absence of fair play exasperated the economic well-being of Charm City’s black population. Marion, like Jesus, literally wept. It was at this juncture in 1967 when eleven of us from disparate walks of life were brought together to ponder these disconnects. We become known pejoratively as the Goon Squad. Subsequently, we welcomed the designation as being meritorious. Marion moved us into roles of supporting the development of Camp Farthest Out. This is where Inner City children were enabled to escape the summer’s heat by spending a few weeks in this pristine setting. This facilitated the broadening of their appreciation of nature and improvement of their academic prowess. In another vein, Marion’s then new position as Fire Department Commissioner allowed him to press several of us into service when the city began to burn in 1968. We went into the hot spots in order to ensure the safety of the residents. There was a lasting bond of brotherhood developed between Marion and me which embraced the highest values of human endeavor. We grew to be such friends and brothers that we were often facetiously referred to as the odd couple. To me he became “Macuba” and to him, I became “Hoelfa.” The endless hours we spent fishing on the Chesapeake Bay and the Atlantic Ocean, along with bowling well after midnight in our younger days, provided us with fond memories. Initially, there were eleven of us but with Marion’s passing, only four remain. The spirits of the departed, fortunately, transcend the distance between earth and bright glory. In ending the discourse I must acknowledge the ecumenical reach insisted upon by Marion and the rest of us. We interacted constantly with others. Persons typifying them would be Sam Daniels, James Rouse, Henry Parks, Chester Wickwire, Peter Angelos, Robert Embery, Martin Jenkins and a host of others too numerous to mention. Curtis, as his grandmother called him, had multifaceted interests and capabilities in many genres. For example, he loved gardening, raising beautiful roses, other flowers, and some vegetables. In another vein, he established a competitive office supply business to demonstrate further that people of color harbored such talents. On many occasions, Marion had me join him in visiting those hospitalized or recovering from illness at home. Parren was not always hospitable, at times, wishing to be left alone. The minister’s persuasive power, however, always prevailed. It was a joy to share the podium each year during Black History Month by addressing the residents at Broadmeade Retirement Community. Spencer Hammond always accompanied us with a musical ensemble. The evening, conceptualized by Chester Wickwire was highly regarded by all and sundry. John Dunn was right, … “Any man’s death diminishes me”. Marion takes a portion of me with him but leaves an even greater share of himself with me. Thanks for the journey, dear Friend. THANK YOU, Mr. Phillips, for sharing. Know assuredly, that your poignant public ‘missive’ is greatly appreciated. These great men (your father included) of whom you and Dr. Favor have spoken, have served well their God and their community. Our prayer is that you, too, continue to be divinely strengthened and illumined along your life’s pathway. My sincere condolences. Ms MB Brown, Thanks so much for your kind words of comfort and encouragement. It’s hard for me to be sad when I realize the extent to which I have been blessed. Blessed to have my heroes within reach, to be able to call these folk “Dad” and “Uncle” and to have been able to sit at their feet and learn from their examples. Take care!